Myrtle Beach is known as “The Seaside Golf Capital of the World” and with that title it has nearly 100 great courses, but everyone wants to know which, are the best golf courses in Myrtle Beach. Of course everyone has their own opinion, as to which are the best golf courses in Myrtle Beach. This a list compiled be Golf.com offering their opinion as to which are must-play courses in the Myrtle Beach area. One other unique feature to the Myrtle Beach area is the large amount of Myrtle Beach golf packages. Myrtle Beach Golf Authority can customize any Myrtle Beach golf package that you might choose. Offering the very best Myrtle Beach accommodations, packaged with any selection of the great golf courses that you one would prefer. Caledonia is a 20-year-old Mike Stranz design that feels decades older. It is built on a former rice plantation and drenched in Lowcountry charm. Much of the golf course winds along the Waccamaw River and features gnarled live oaks loaded with Spanish moss along its fairways. Caledonia measures 6,526 yards and plays to a par 70, but it keeps the long hitters honest with wasye bunkers, wetlands and undulating greens. The Dunes Golf & Beach Club is a private golf club, however there are certain golf packaging companies in Myrtle Beach that offer The Dunes Club in their packages. Robert Trent Jones, Sr. designed the Dunes Club in 1948 and it features all of the famed architect’s hallmarks. The course is fiercely bunkered with elevated greens mind-blowing water holes. The famed 590 yard, par 5 13th doglegs 110 degrees to the right around Singleton Lake. Befittingly it is nicknamed “Waterloo”. The Dunes club recently renovated their greens with new grass and other tweaking to bunkers and tees. was ranked No. 86 on Golf Magazine’s Top 100 Courses You Can Play. The Love course features Donald Ross-flavored turtleback greens and chipping areas. It also features re-created plantation ruins along five holes on the front nine. This course is one of everyone’s favorites. Ken Tomlinson designed this jewel in 1990 that features low-profile fairways that wind through forested bluffs and along marsh-edged flatlands. It is a very scenic course so be sure to take your camera. The par-3 12th is a 189-yard carry over a marsh to a very well bunkered green. Ocean views come next at the par-5 13th. Tidewater recently replaced their greens with MiniVerde Ultradwarf Bermudagrass. While the greens were being redone, they also improved tee boxes, bunkers, tree removal and sodding of many areas. True Blue is a Mike Stranz designed course that opened in 1998. It is a links style setting, with holes framed by , mounds and large waste-areas. True Blue is a par 72 that features five par-5’s. 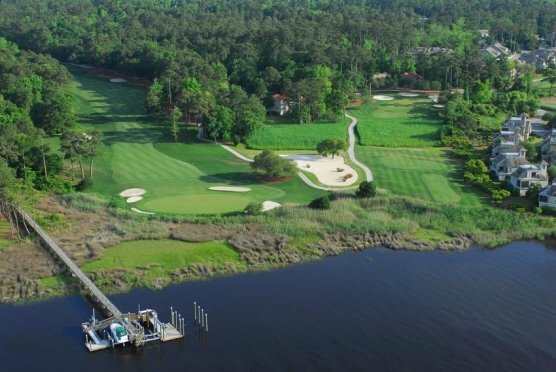 Tom Fazio designed TPC Myrtle Beach with plenty of his trademarked bunkering. It has tree lined fairways on the front nine that lead to a more watery back side, which includes a semi-island green on the par-3 17th and a par-5 closing hole that is reachable in two for the long-hitters who are willing to gamble with a second shot over water. The Legends Heathland course debuted in 1990 and was designed by Tom Doak. It offers a feeling of an Ireland or Great Britain links course, with holes modeled after counterparts from The Old Course, Lahinch and Cruden Bay. The wind that the Legends Heathland course offers is all natural. The Resort Club layout was designed by Roger Rulewich and opened in 2001. 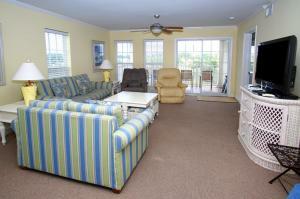 It has many holes with views of the Intracoastal Waterway. The course measures 7,678 yards from the tips making it one of the longest courses in the country. Being along the Intracoastal Waterway it also offers plenty of wind. The Heritage Club is one of the Legends Resort golf courses. The Heritage Club is located on Pawleys Island and offer wildly undulating greens that you can three-putt in a heartbeat. Standout holes include the par-3, 228-yard 13th that is all carry over water and the 506-yard, par-5 18th. The oak lined entryway is beautiful. par-5 sixth hole has an island fairway while the par-3 12th features an island green with bunkers shaped in the state of South Carolina. Pine Lakes Country Club is known as “The Granddaddy” because it was the first course in Myrtle Beach, debuting in 1927 under the name Ocean Forest. The inaugural president of the PGA, Robert White, a Scotsman, first crafted nine holes, and it’s that original nine that architect Craig Schreiner elected to preserve as the back side for a revised layout that reopened in 2009. The result is a throwback design that conjures up classic strategic shot values thanks to enhanced contouring and thoughtful hazard placement. Legend has it that the clubhouse, Snug Pub, is where the idea for a magazine called Sports Illustrated was born in 1953. Book your Myrtle Beach golf package today and play any of our beautiful Myrtle Beach golf courses and make YOUR choice of which are the best golf courses in Myrtle Beach.